Mystic Seaport Wedding Photographers are able to experience events along the tranquility of the Mystic River. Mystic Seaport is the nation’s only maritime museum, and is a popular historic attraction in along the Connecticut shoreline. It is also a popular wedding destination and a perfect setting for Mystic Seaport Wedding Photographers. 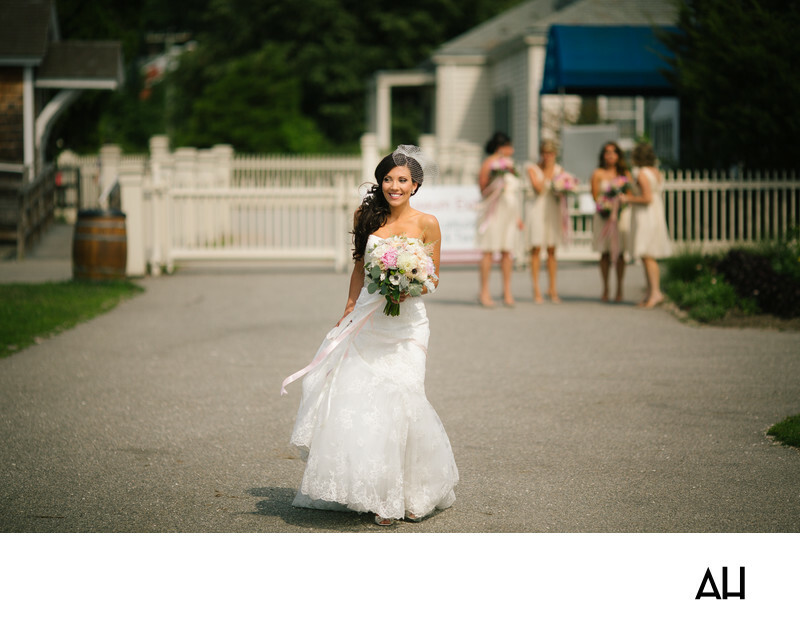 In this image from a Mystic Seaport wedding celebration, the bride walks along the pavement and takes in the quaint New England village that surrounds her. The bride is stunning in a gorgeous white wedding gown that is covered in a layer of lace. The lace is covered in delicate floral designs and flows gently around the bride's silver high heeled sandals as she steps forward. A pale pink ribbon is tied about the bride’s waist, and it blows around her as a summer breeze travels over the mainland. The bride beams into the sunlight, a netted veil shading her eyes. She is quite possibly the happiest girl in the world in this moment as she makes her way to the wedding ceremony where her husband-to-be patiently awaits her arrival. In the background of the picture, the bridesmaids stand in front of a white picket fence and some Mystic village buildings. They chat about their dresses, hair, and the events that are to come. In a few minutes the bride and her maids will continue their walk down the street to the location of the wedding ceremony. There the bridesmaids will lead the bride down the aisle and before the waters of Mystic she will say “I do”.